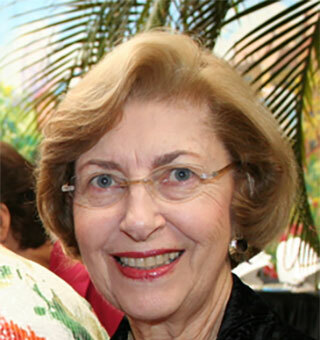 Barbara L. Chertok has served on the National Advisory Board of the American Hearing Research Foundation since 1991. She brings a unique perspective on hearing loss to the Board. Suddenly deafened at age 21 from Cogan’s syndrome, an autoimmune disease, she has been a successful cochlear implant user since 1997 and founded two cochlear implant support groups in her home state of Florida. In 1982, Chertok made history when she was selected as the first person with hearing loss to serve on a jury in Maryland. She was assisted in the jury box by an Oral Interpreter who silently repeated the court proceedings as she read his lips for the duration of the four-day trial. During her career, Chertok has worked fervently to educate, mentor and advocate for people with hearing loss. She was certified as a Reverse/Oral Interpreter, taught lipreading for many years, and has lectured at conferences in the United States and abroad, as far as Israel and Australia. Chertok is a freelance writer for Hearing Life magazine and other journals. Click to see her latest article – an interview with world’s first recipient of both a cochlear implant and an auditory brainstem implant.